This was of course the single which found a whole new audience for Yes, and effectively served as their cross-over song. 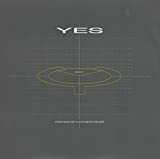 It's fair to say this was not a deliberate decision by the band, the song originating from sessions with Trevor Rabin which were not initially intended to result in a Yes album. Notable absentees are Steve Howe, who had taken up his role with Asia at the time, and Rick Wakeman whose place was filled by his predecessor Tony Kaye. The song itself is a fine piece of melodic rock, with a solid rhythm, and a killer hook. 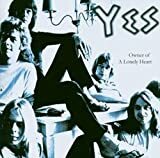 It may not be prog for the prog purists, but it did serve to bring Yes to the attention of the masses, and thus revive interest in their back catalogue. There are three tracks in total on this 12 inch single. "Our song" is taken straight from the "90125" album. The B side is entirely occupied by a "red and blue remix" of "Owner of a lonely heart". 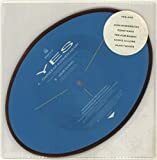 This extended dub version would have fitted in well on The "Yes remixes" album, indeed, it may have been the inspiration for it. It is though, a tediously dull and uninteresting hatchet job which simply repeats the main theme ad-nauseum. Various superfluous effects are thrown in, but despite its length, there is nothing of interest here at all. Good song, but this release for collectors only. I guess that the target group for this EP from the album "90125" were the discotheques for the inclusion of an extended remix of "Owner". This version has been released since then on the extended version of "90125". Like I said in my review of the album, this version is absolute crap. Disgusting from start to finish. The original "Owner" (slightly edited here) on the contrary is a good song. 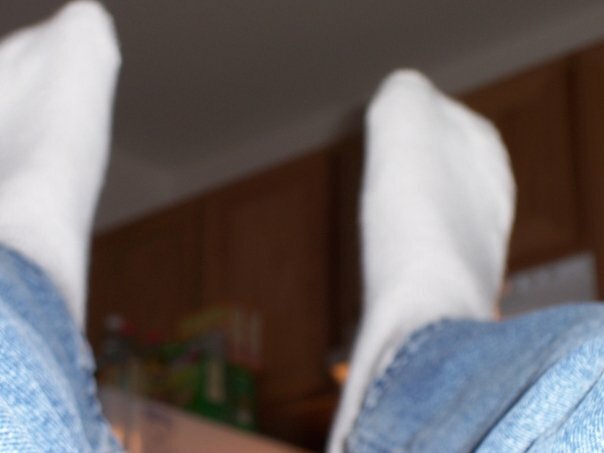 Great tempo, fresh and funny. "Our Song" is another good track of the album : good rocking tune with nice vocal harmonies (even if it is a commercial tune, created to please the FM stations probably). This EP is absolutely useless now since the only two listenable tracks are already available on the album. Two stars. In addition to the Owner of a Lonely Heart single, Yes also released an EP featuring a special "red & blue" dance remix of the song. Clearly this release was intended for the dance clubs at the time and like most songs that had this treatment, it is just plain terrible from beginning to end. They basically took an okay pop song and turned it into a throbbing headache. I can't recommend this to anybody except for collectors of rare 12-inch singles and EPs of prog bands making crappy music AND who also only want to put it in their collection and NEVER listen to it. Trust me on this one. It really is that bad. One star, less if possible. 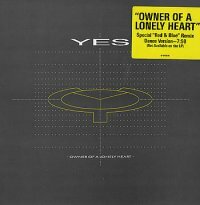 "You've got to want to succeed"
Owner Of A Lonely Heart is one of my least favourite Yes songs of all time. Unfortunately it is also the band's most widely known song by far. 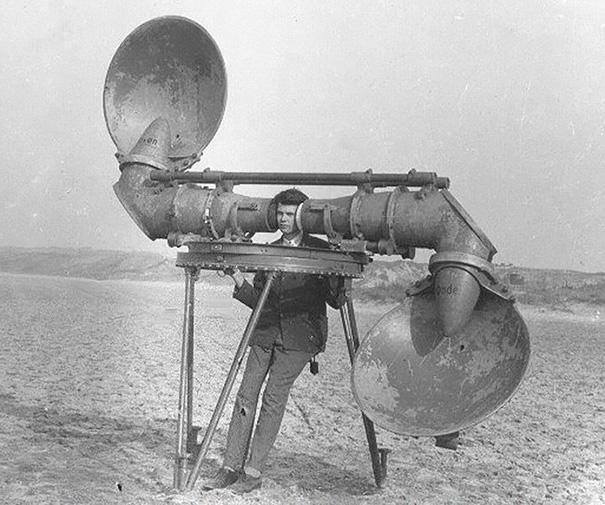 It is indeed hard to find anyone who hasn't heard it! The song is the opening track on the 1983 album 90125 and was also released as a single to promote that album. The single contains an edited version of the song which runs for just under four minutes while the album version is about half a minute longer. The b-side of the single is Our Song, also taken from 90125. The latter is a decent song but since it is the same as on the album, it is of no added value here. The 12" version has in addition to the same two tracks mentioned above also a special Dance Remix of the title song which runs to almost eight minutes. As if the regular version wasn't bad enough, this aimless remix is hard to listen to and deserves at most a single listen by a curious and devoted fan. But it is really best forgotten altogether! If you have the 90125 album, there is nothing here worth seeking out. 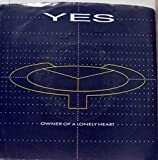 Post a review of YES "Owner Of A Lonely Heart"